Recently, JAK inhibitor drugs FDA-approved for use in treating a severe bone marrow cancer (myelofibrosis) were given orally to patients with moderate to severe alopecia areata in an ongoing study to test their safety and efficacy. We know first-hand the frustrations of patients who are on the receiving end of advice and suspicion from friends and family: are you sure you’ve been to the best specialist? Wow, have you seen this new ‘discovery’? Don’t you want to try something to regrow your hair? Equally, we know, too, the sadness that envelopes the deafening silence of guilt, the dark hole of secrecy and the garden variety of social discomforts short-circuiting the happiness of women with alopecia. That’s why we want to arm you with information and news you can use regarding these treatments. With our blog, we hope you’ll be better equipped to answer questions, and feel confident to do more than simply shrug off questions. 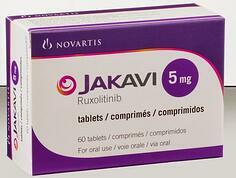 This week, we’ve pulled together a summary about one of these drugs, ruxolitinib, (brand name Jakafi®). It was used in the open-label, ongoing alopecia drug treatment study co-lead by researchers Raphael Clydes, MD, PhD and Angela Christiano, PhD at Columbia University Medical Center. In 2014, being informed is especially important because of the online publication of the doctors’ research in Nature Medicine widely circulated with much media attention. The published report in Nature Medicine details the study and reports that three study subjects regrew hair. If their hair growth will continue without the drug is not known. If they will suffer serious side effects is also unknown. Results on the other nine subjects has not been published. JAK inhibitors marketed by Incyte and in partnership with Novartis and Eli Lilly drug companies are small molecules aiming to reduce inflammation. In the case of alopecia areata, an inflammation at the bulb of the hair follicle interrupts the normal hair-growing phase without destruction of the follicle structures themselves. To broaden our understanding of the wide range of information our community hears, we assembled a variety of headlines from online sources. Rita Rubin, journalist for WebMd Health News interviewed several of the principal parties in this study including Angela Christiano, PhD, an acclaimed researcher and professor in the departments of genetics and development at CUMC and Dr. Raphael Clynes. Q: Why would anyone take a potentially risky medication for months just to regrow hair? Q: When the people in the study stopped taking ruxolitinib, did their hair fall out again? Q: Wouldn’t it make more sense to rub the drug on the skin where yiuo’d like to grow hair, rather than swallowing it in a pill? A: “It would be wonderful to have both an oral and a topical version of a drug that could cause hair to regrow in alopecia areata patients” Clynes says. But no topical form of ruxolitinib or tofacitinib has been approved for human use, so he and Christiano mixed up their own with ingredients from China and tested them on mice with excellent results. JAKs are part of a family of enzymes that block certain proteins that influence the intra and inter-cellular activities of cells especially those activated in inflammatory and immune conditions. Ruxolitinib was already approved for use in humans as a treatment for bone marrow cancer (myelofibrosis) when it was used experimentally as both a topical and a systemic drug in a strain of mice who are bred with susceptibility to alopecia areata. Cream and pills were used on mice; pills only were used on human subjects in the Columbia University studies. Although overall this is exciting news, it appears as though our community would benefit from further testing before rushing to their doctors to receive this type of treatment as Dr. Clynes has said. We know just how easy it is for friends, family, and even those of us with alopecia to get caught up in headlines, but at this point with so many things unknown about these treatment options it is sobering to hear reminders from physicians that there is still a long way to go before a safe, reliable treatment option is widely available.